We’re doing a mini-series where we are exploring a few regions in mainland China. We started with Shanghai and today are moving onto the southern city of Shenzhen! Shenzhen is less than an hour away from Hong Kong by car, and is the closest big city in the Mainland to Hong Kong. The city is best known as the center of China’s rapidly expanding tech industry (home of Chinese tech giants TenCent, Huawei, and the like). However, this southern coastal city also boasts an ever-changing landscape of architecturally stunning skyscrapers as well as an intense, optimistic buzz from its ten million residents who have descended upon this city for its numerous jobs and opportunities. What’s crazy is . . . this tech giant of a city was a mere fishing village some 30+ years ago. Its population exploded after the Chinese government marked it as the first of its four Special Economic Zones in 1980. As a result, Shenzhen is comprised mostly of “immigrants” from other parts of China who moved to the city for better opportunities. Mandarin is spoken here, unlike the rest of Guangdong province where Cantonese rules. From a food perspective, this means that Shenzhen doesn’t really have much of its own local, traditional cuisine. However, Shenzhen does have some specialties that have sprung up in more recent years. One of the most famous is the coconut chicken hot pot. The coconut chicken hot pot originated from Hainan but was made popular by the Shenzhen group of restaurants called Seasons Coconut Chicken Hot Pot or 润园四季椰子鸡 (rùn yuán sìjì yē zǐ jī). Seasons has been around since 2009 and focuses on three main Hainanese specialties: coconut chicken hot pot, clay pot rice, and a number of cold dishes. Their restaurants are decorated with a Southeast Asian feel. 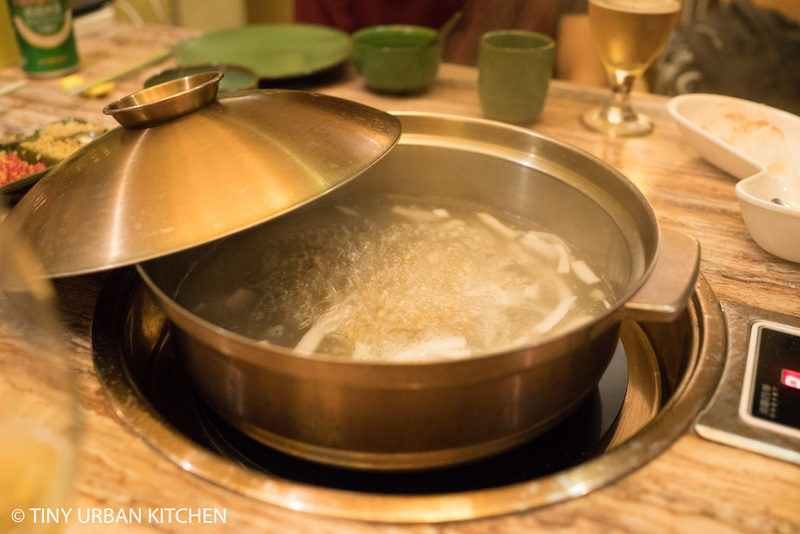 Diners get their own semi-private “rooms” where they can enjoy their hot pots in a cozy and quiet space. The restaurant originally imported all its coconuts from Hainan, but due to increased demand (there are now many other “copycat” restaurants serving basically the same concept), they started importing coconuts from Thailand. Seasons still imports all its chicken from Hainan. The chickens are “Wenchang” free-range chickens. The restaurant also uses fresh coconut juice as the hot pot soup base (and it’s sooooo good). Once they put the chicken in the hot pot, they give you an egg timer to ensure that you don’t over-cook the chicken. In short, once the timer runs out, it’s time to start eating the chicken! I was not sure what I would think of coconut chicken hot pot, but I was surprised that I really really liked it! Even Bryan, who can’t stand coconut water, really enjoyed the hot pot. The coconut water adds a pleasant and fragrant sweetness to the broth, and the chicken imparts the much needed umami. The whole meal felt light, healthy, and restorative. I liked the “ponzu”-like sauce that we could optionally used. Frankly speaking though, the coconut chicken and coconut soup was so fragrant and flavorful, I ended up just eating it on its own. We also ordered another one of the restaurant’s Hainanese specialties, claypot rice with Chinese sausage and mushrooms. Though we were so full from the coconut chicken already, it was still nice to enjoy some rice and added variety to the meal. All in all, I had a fantastic time enjoying this unique Shenzhen specialty at Seasons. I liked it so much I even tried making my own version of coconut chicken soup at home by poaching some chicken in boxed coconut water. It wasn’t nearly as good as the version at Seasons (I think their use of fresh coconut water and high quality chicken is key), but it still reminded me of the flavors I had enjoyed. After returning to Hong Kong, I realized there are several restaurants in Hong Kong who have also adopted the same concept. I have yet to try any of them yet, but I am quite curious to see how they compare. In short, if you are in Shenzhen, I would highly recommend trying coconut chicken hot pot at Seasons. Average cost per person is 100 yuan / $16 USD for the coconut chicken hot pot, which is quite reasonable considering how much coconut water is used! There are many locations in Shenzhen (see links below), so it should be relatively easy to find one that is close by. I have since visited Shenzhen many times and have dined at many different places, but this meal is still one of my favorites to date. If you don’t speak or read Chinese, you can show the taxi driver the address on your mobile phone and they can usually punch in into their GPS.